This holiday season at Black Knight Games we will be hosting a fun Cheat for Charity: A Magical Holiday MTG event. Cheat in MTG you ask? Yes. Splinter Twin, Birthing Pod, Gitaxian Probe, Stoneforge Mystic and all the other goodies are UNBANNED for One Night Only and are more then welcome to join the party. This is your chance to create the deck you’ve always wanted to and use it to battle for some outstanding prizes! What’s the catch? It’s going to cost you for each banned card. Entry Fee: $8 ($7 Stronghold members) – OR – 2 Hero’s Rewards. All entry fees will be donated to The Alzheimer’s Society of Hamilton. Prizes: We have something very special for this Charity Event. At San Diego Comic-Con 2015 Hasbro offered a limited-edition collection of double-faced Planeswalkers cards from Magic Origins. The five cards were presented with unique “black-on-black” illustrated by Wayne Reynolds. 4 – 0 players at the end of the event will have their choice of a Planeswalker from this set (most donations will be the tiebreak for pick-order). Remaining Planewalkers will be distributed randomly in the door prizes. In addition, we will have lots of Door Prizes, Promos, Hero’s Rewards and more! Just because all the funds are going to charity doesn’t mean we won’t have great prizes! Cheating Rules: In order to use banned cards and cheats during your matches, you will have to purchase tickets. You may purchase tickets before or during the event at any time! Now how are you able to use the cheats in the game? Spend a ticket and use the effect you want at instant speed! Your ticket then goes into the door prize pool for your chance to win some sweet swag! Using a ticket to cheat is like playing a card. Priority rules. For the cherry on top, we will give the Top Donor of the Day a seat at our Grand Championship Invitational Event! So be a darn, dirty, cheat – after all, it’s for charity! Booster Box Preorder Price: $459.99 (Reg $499.99) SAVE $40! Deposit: This is a very premium item, and we recognize that it’s not cheap. To help out we are only requiring a $150+tx deposit to reserve your item. The difference is due on pick-up. Pay with Hero’s Rewards: Have you been saving up those Hero’s Rewards from the events you’ve been attending? For this item you can trade in 25 Hero’s Rewards to knock $100 off the price! You can do this as many times as you’d like. Check out the full announcement for the set, including the amazing list of cards that are possible Box Toppers. Tarmogoyfs, Tutors, Lilis, and more! Preliminary Pro Tour Qualifiers have been a way to move up the ladder from your local shop all the way to the Pro Tour. Recently Wizards has decided to change up the path to the Pro Tour, which makes this PPTQ our last. So we are going out with a bang this December with this Standard event! Prizes: The winner of the event will get an invite to a Regional PTQ. Additionally we will be putting $25.00 per participant in to the prize pool. The prize pool will be split among those in the Top 8, with more going to those that make it furthest. All participants get a Hero’s Reward, and Stronghold Members get two. On top of qualifying for a Regional, the winner of this PPTQ event will also qualify for our year end Invitational Event! So join us for our last PPTQ event! We continue with our monthly Legacy tournaments this November! Black Knight Games is happy to announce that we will be running Standard Showdown each Saturday during the Guilds of Ravnica season! Showdown is great because in addition to our regular Standard prize pool, we will be adding 9 Standard Showdown packs too! Prizes: 1.5 Guilds of Ravnica Booster Packs/Player will be added to a Prize Pool to be split among the top players. Additionally at each event we will give out 9 Standard Showdown packs (Players that go at least x-1 player will each get at least one, and the rest will be passed out randomly among those that attend. These events do not count towards the FNM Standard standings. The ultimate game crossover is happening this November when the world of Magic: the Gathering becomes playable in Dungeons & Dragons! To celebrate we will be running a very special weekend of events including events for both D&D and MTG, an incentive to play in both, promos, and early-release product too! Product Releases: On Ravnica Weekend we have the special Guild Packs released for MTG. We will also have an early release on the D&D Guildmaster’s Guide to Ravnica book & Dice (regular release is more than a week later)! Prizes: We will add 1.5 Boosters to the prize pool per participant. Additionally we have very special foil basic lands to give out to participants, while supplies last. If you participate in both events, you will get in to the D&D event for free! So join us to celebrate this exciting merging of worlds with us with two special events, and some amazing prizes and product releases! We continue with our monthly Legacy tournaments this October! Guilds of Ravnica Release: Wizards has announced that Guilds of Ravnica booster boxes will continue in Core 2019 and Dominaria’s shoes and have a special preorder perk – you will be able to get your boxes of Guilds of Ravnica boosters a week early during Prerelease Weekend – first come first serve. Core 2019 Exclusive Buy-a-Box Card: On top of that you will get the Standard-Legal buy-a-box promo card which will be exclusively available as a buy-a-box card – there will be no other way to get it. 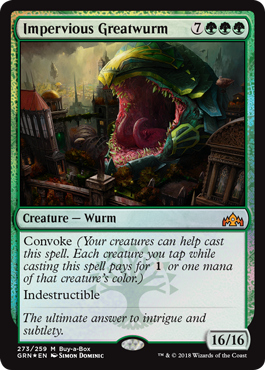 The card is ‘Impervious Greatwurm‘, and it will be limited to the first 60 people who order or buy a box of Guilds of Ravnica from Black Knight Games. Pay with Hero’s Rewards: Have you been saving up those Hero’s Rewards from the events you’ve been attending? Well you can always trade us 40 Hero’s Rewards and get a booster box for free! So you can take advantage of this special using only Hero’s Rewards! So get those orders for your Guilds of Ravnica booster boxes in soon to guarantee yourself one of the early boxes, with buy-a-box promo for a better price!